Cecil B. DeMille never did things by halves. 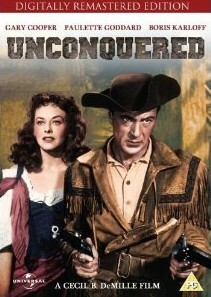 Unconquered is an old-fashioned epic, but, as I am wont to say, none the worse for that. Shimmering in gorgeous technicolor, the film re-unites DeMille with two of his favourite cast members- the ever reliable Gary Cooper and the ever lovely Paulette Goddard. Intriguingly, it is a period piece- set in the 18th Century- showing that the director (who also produced the film) was equally at home in seemingly any era. One particular point about the film is its "remastered" status. Occasionally this becomes a meaningless tag, applied to DVDs as a selling-point, but, pleasingly, Unconquered can truly be considered "remastered"- both sound and picture are excellent. Given the subject matter and overall scale of the production, the mise-en-scene and overall "look" of the film are vital. With a poor quality print this impressiveness would be lost, hidden 'neath digital artifacts and compression. This Odeon Entertainment edition is the antithesis of this, and, consequently, the locations sparkle like the actors- this is truly one of DeMille's great films, although its considerable length (over 140 minutes) may surprise some. With a film of such scale and scope, some sort of clarity becomes necessary- this is provided via an expository voiceover at the start of the film, which becomes an unashamed flag-waver, a recognisibly modern piece of patriotism that is easily glimpsed through the historical facade. After that, the film is allowed to speak for itself- the events unfolding easily in a film that, for all its epic qualities, tells a very human story- that of endurance and determination. At times, the film becomes an intriguing mongrel- there are parallels to Treasure Island and even a Fordian western like Drums Along The Mohawk. But, above all else, the film is a historical film- one that chronicles a specific time in American history. The actual plot of Unconquered is not one to reveal here (indeed, such an action would be counter-productive!) but suffice to say, as with any DeMille film, scale is never allowed to denegrate intricate human relationships- these take place against the vast backdrop rather than being dominated by it. Another important aspect of DeMille as director, producer and ultimately creator, is his use of stars. Here, two fine stars are supplemented by a clutch of character actors and over 4000 extras. For us now the amazing scope and scale of DeMille's films is barely credible. For him it was merely 'business as usual'. Unconquered is available from April 18th from Odeon Entertainment.